TATA Motors unveiled the revitalized Safari Storme this week amid a lot of fanfare. Refreshingly, they chose a Twitter promo on digital to create buzz instead of the predictable webcast + Facebook Brand Page integration formula. The three day contest asks Twitterverse to share their witty and original comments with the hashtag #bravethestorme. There are daily Storme Survival kits to be won and one lucky winner gets to drive away a new Safari Storme! Participants can unlock Storme Badges and move across levels to increase their chances of winning the grand prize as they tweet, retweet, follow @tata_safari and engage with the brand on Twitter. 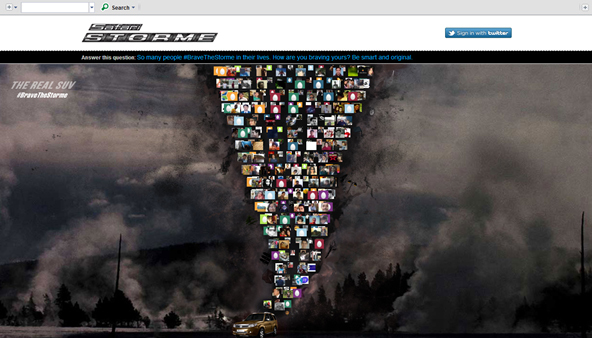 Brave the Storme contest microsite is a super concept and execution where they have created an animated Twister comprising of contestant's Twitter image thumbnails, with the refurbished Safari standing at the centre of the storm. You can click on the images to view Twitter posts. Users can login using Twitter connect and start tweeting and earning points. Posts on the Facebook Brand Page direct fans to this contest. TATA Motors also took over the Yahoo! India Email Login Page on launch day. This is an excellent end-to-end execution. The Twitter promo though is reminiscent, in part, to the #anything4jetta promo from Volkswagen. TATA has launched its ace player in SUV segment,the all new Safari storme.This giant speed machine is a lethal combination of excellent exterior with classic interior.And its useless to doubt over its immense power.Its made for broken ways. The new Safari has come with an excellent makeover and it will swipe its competitors in a storm.It got so much masculinity and power that it suits to the hilly and plain terrains of India.